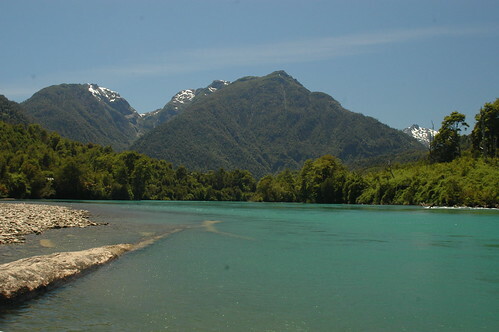 The Rio Puelo is a unique color of turquoise. The volume and surge of the river is impressive, especially during the boat runs up river. The amount of water to fish was overwhelming, so we used the boat to reach the best riffles. The gusting wind and the biting Tabanos created a challenging fishing scenario. We discovered while we were protecting ourselves from the Tabanos, and knocking them into the water, fish would occasionally eat them. A splashy rise would erupt in the steady stream of Tabanos floating down river. The hard part was locating a trout willing to rise more than a few times, and we found very few of those fish. Max did catch a brown on a big foam dry in a side channel to start the day. I was fishing nymphs under an indicator on my Sage TCX 11’9” 7 weight switch rod. I quickly hooked and lost a decent bow on a rubber legged nymph. I began cycling through flies and working the same drift. Big trout were known to hold on the inside edges (inches deep) of the shallows. I was still surprised when a big fish rolled in shin deep water with my nymph in its mouth. I started to chase the fish downriver, as the big rainbow jumped in front of Alex and Pipo. I watched as the backing started to go through the guides, and the fish took me into the main river current. Moments later I felt the line go slack, and checked to find both flies still there. At the time I shrugged off losing the 20 inch plus fish, but the rest of the day I only hooked one small fish. The river was huge, but the three of us drifted different flies through the best looking water. It always felt like a fish was just another cast, or fly change away. We fished big nymphs on heavy tippet, small midges on light tippet, and all variety of weighted caddis patterns. We abandoned one technique for another when nothing produced. I quickly switched to streamers, while Max and Alex tried dry/dropper rigs. We even got dropped off at an impasse for the boat, and hiked up river to a hard to reach section. I took a gamble and decided to stick with streamer fishing until dark. I changed spools to a sinking tip line for the deep holes, and used the floating line in the shallow riffles. In a few hours of swinging flies I had one hard grab, a large fish flash in the shallows, and a big brown chase the streamer to the rod tip. I tried Zonkers of all variety, color and size. A size 4 white Polar Zonker produced the best results, and closely matched the Chinook Salmon smolts in the river. Alex snapped us out of our funk when he hooked into a big rainbow. I filmed while Max chased the rainbow down with the net. This fish reawakened our urge to keep fishing, and set off a chain reaction. I had fished a streamer all day in the hopes of catching an early Chinook Salmon, but that honor was bestowed on Max. I heard him yelling down stream of me and Alex grabbed his net. I just switched back to nymphs, and a huge rainbow nosed my indicator twice, so I wasn’t moving. I eventually started filming when I noticed the bend in his seven weight. The fish was within twenty feet of the me, and easily over thirty inches. The fish took a tan Zonker on 15 pound tippet. 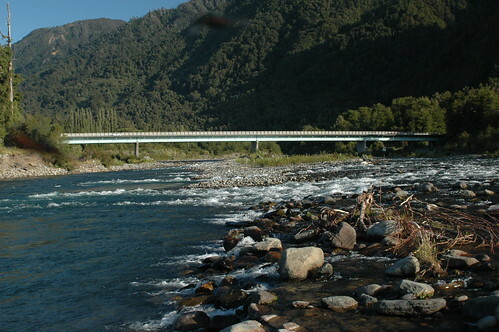 The latest video post features fly fishing on the Rio Puelo, Chile. This entry was posted in fishing report, video on February 22, 2011 by Jason du Pont. The Gunpowder River is flowing at 28 Cfs is 37 F and is gin clear throughout the catch and release area. Birds are chirping, the sun is shining and… the trails are treacherous. This week we’ve a lot of snow and ice letting go, refreezing and now slowly clearing along the Gunpowder. I was out on the river Monday with Candy Thompson from the Baltimore Sun checking wader wash stations. At Masemore, Bush cabin Run looked like a milkshake while the river upstream of this feeder creek was, you guessed it…gin clear. On Wednesday, we had a lucky fly angler from York County, Pennsylvania report the first fish of the new year caught on a mallard winged stonefly pattern right out of the muffin tins on the front counter. It was an honest 15″ and took the fly in a backwater eddy-ever wonder why the shop is called Backwater Angler? Thanks to Skye for the following stream reports and photos. Gunpowder…not a soul in sight! This entry was posted in fishing report on February 19, 2011 by Theaux Le Gardeur. The last three days of our fishing journey in Chile put us on the road to the Rio Puelo. We had to go back into the city, load up the big boat, and restock on groceries. The four hour plus drive was pretty long, but the scenery was hard to beat. 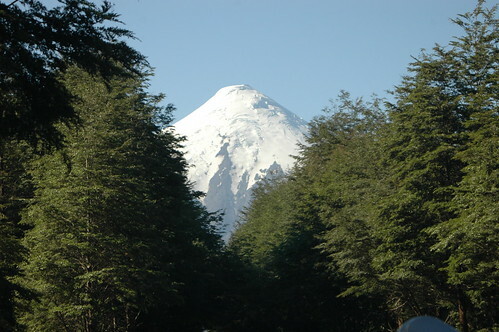 We passed over rivers and streams constantly, and Mount Osorno grew from a distant white capped volcano, to a looming giant. The pavement turned to dirt roads. Huge mountains with sharp peaks stood tall against the sky, as we drove along massive estuaries and lakes. Some of the rivers entering these estuaries, including the Puelo, experienced runs of Chinook Salmon, Atlantic Salmon, steelhead and sea run browns. The Chinooks were just starting to run, but it was early, so we were targeting the resident browns and rainbows in the river. The drive was going smoothly, until we blew a tire on the trailer. We got the bolts loosened up, just as a local pulled off to help speed up the process. We hurried to the boat ramp, and began loading the boat with all our gear and groceries. The sun was setting, and Pipo navigated up the maze of logs and rocks in this massive river. Fortunately, he had an intimate knowledge of the river, and got us to the camping spot. We unloaded the boat and started a big fire. I set up my accommodations in the sand. The whole day was spent traveling, but we had the river right outside our tent flaps for the next two. The fire roared bright as we prepped a simple dinner, with the rush of water as background noise. We even heard a few big kings crash on the surface in the deep pool in front of the beach. We found some great wood for bench seats, and even a tying table. We ate a late dinner and discussed the plans for the following day. 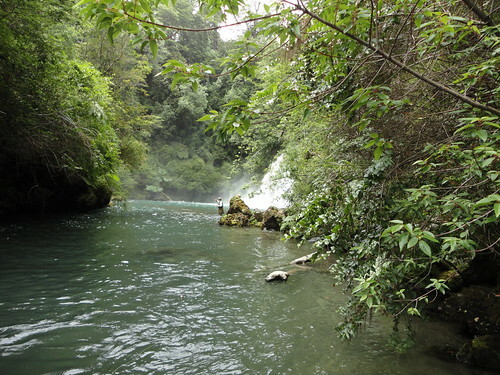 The latest video post is traveling to the Rio Puelo. This entry was posted in fishing report, video on February 9, 2011 by Jason du Pont. Chilean rivers are other worldly. 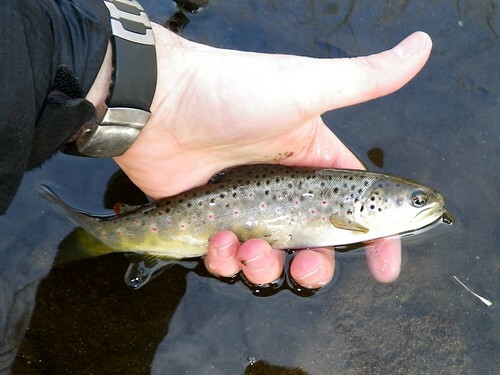 It is hard to put your finger on it, but these are not your everyday trout rivers. It could be the lush jungle environment, or the blue-green water usually reserved for tropical saltwater paradise. Add in Summer temperatures in January, epic views and the fishing is a bonus. 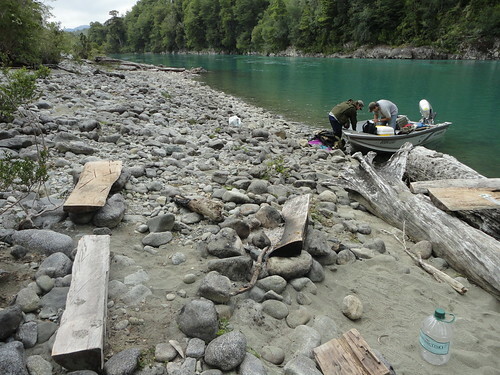 Exploring the rivers in Chile brought with it the excitement of the unknown. Just driving over a bridge could provide a passing glance at a beautiful trout river that seemed so foreign. 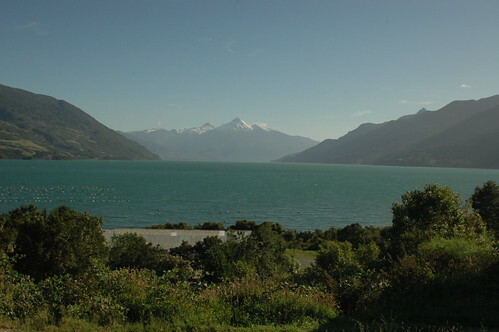 The most striking feature of the rivers in Chile was there were so many of them. We passed rivers daily, of all size and variety, and all held trout. We passed spring creeks so small you could straddle, or so big you could use a drift boat. We drove over cascading streams high in the mountains. We saw where rivers entered lakes, and where lakes narrowed into rivers. The first river we fished was the one above, and yes, that is a massive waterfall thundering down behind Alex. We climbed down some rough terrain to get to the river’s edge. I looked down and noticed a big brown (22-24 inches) slowly swim over to the vine ridden far bank. The three of us spread out, and started fishing caddis pupa and rubber legged nymphs. I managed to catch possibly the smallest rainbow in Chile, a three inch fingerling. I kept dredging the spot where I saw the big brown take cover. There was a sense of urgency, because we had to cover a few miles to reach the road again. I decided to try a few more drifts and changed my dropper to a hot pink San Juan worm, a wild brown trout favorite. The next drift along the wall got a hit immediately, and I set the hook. The fish dove to the bottom, and I started putting pressure on what felt like a huge fish. Six seconds later the fish began head shaking, and threw the hook. I was hoping to at least see the fish, but it remains a mystery. We tried using the high banks to spot fish from a distance. The river was very low and clear. The trout were not visible in pools that usually hold fish. Pipo thought the three weeks without rain, and the bright sun caused the trout to take cover. We worked the deep holes and riffles, and caught small rainbows. We found where a big spring creek entered the river, but the four of us couldn’t spot any trout amongst the cressbeds. I switched to a streamer and covered a section of river littered with huge logs. I never got a single hit, and after two hours we decided to relocate to boats in a lake. The second river we fished was four days later, and it was only two hours in the afternoon. Our plan to access a lake was thwarted by the trail being completely overgrown, so we started throwing out other options. I suggested trying the Gol Gol river (above) that we passed over minutes ago. It was moments later I realized my waders and boots were not in the truck, since I was expecting to fish in the boat. We found a nice section that offered me the chance to fish from the shore. I put numerous drifts through this pool where the river diversions flowed together. I quickly hooked and landed a nice seventeen inch bow. Many drifts later a big head surfaced and a trout ate my Thingamabobber. Out of reflex I lifted the rod, and the fish held on for a few seconds, but eventually let it go. When 9:00 p.m. rolled around we hiked back to the truck. It seemed the trout could be as elusive as the rivers were beautiful. We took advantage of the last hour of daylight by eating a riverside tailgate dinner of pasta with Chilean red wine. This entry was posted in fishing report, video on February 2, 2011 by Jason du Pont. A recent release change at Prettyboy Dam dropped flows on the Gunpowder to the 28-30 CFs range. In low flows many trout will hold in the best water, so anglers should focus on the deeper runs and riffles. 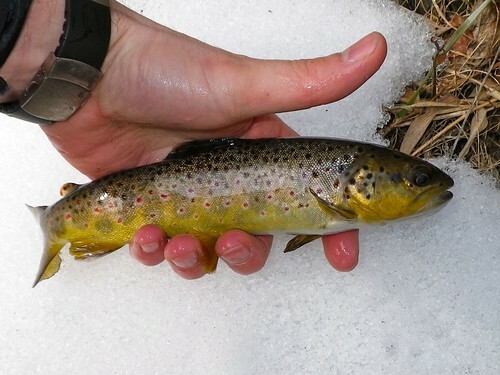 Winter fishing can be a challenge, but the reward of catching trout is well worth it. Thanks to John Burger for passing on his report below. Fished Masemore stretch on Sunday after I left the shop. Did not see anyone for first 3 hours. Rigged with 9′ 5x leader, extended with two sections of 6x flouro per your guidance. Leader was between 11-12 feet. Indicator 6-7 feet up. Fished two spots for 45 minutes each. Fished both patterns you gave me and tried a couple of other similar midge patterns I had (black, cream, brown etc). No Joy. Then swtched up to red copper john on top and rojo midge on bottom. As soon as I did that, got first fish on red copper john. Two casts later another fish, again top fly. Then decided to go “all red”. Size 18 red copper john and size 20 red midge pattern. That’s when I could not keep them off the line. Dialed in a couple of seams in the same hole at the bend and fished for 2 hours. Caught 8 and missed many (A little rusty on the set on subtle takes). Nothing big. Largest fish 11 inches. Other notable observations. Lots of snow falling from overhead trees. 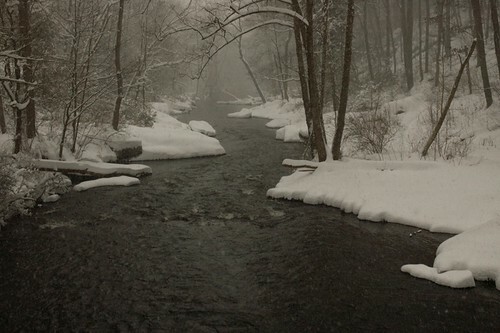 The heavy snow really bombarded the river, and me once, especially when the wind blew a bit. Thought that might have spooked the fish at first, but found they did not seem to care. Feel free to post this. This entry was posted in fishing report on February 1, 2011 by Jason du Pont.